Please Note: We will be OPEN Thursday, February 8th from 3:00-6:00pm. We will be CLOSED Friday, February 9th and Saturday, February 10th. Valentine's Raffle Refer a loved one this month and be entered to win a $100 gift card for the Fulton Theater. New Patients that have been referred will receive their 1st Visit for just $14. 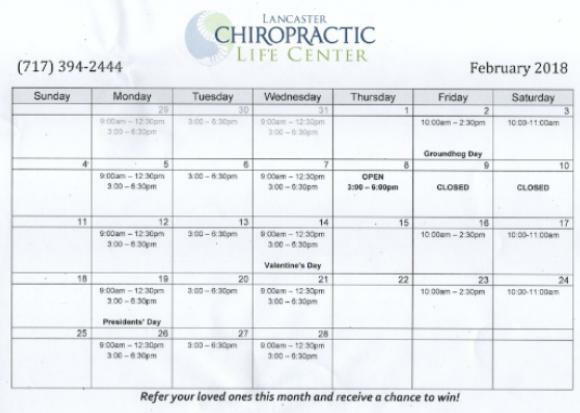 New Patients must mention who they are referred by for these offers to be received. Drawing will be held at the end of the day February 28th. Referrals must have had their appointment by the time of the drawing. LOWER Your Blood Pressure Naturally... One of the best ways to prevent heart attacks and strokes? Keep your blood pressure in check. Yet 65 million people already have hypertension - and 20 million people are teetering on the brink so if you're one of them or you know someone that has high blood pressure, this information could be very helpful. A daily dose of 1,000 mg of Olive-leaf extract has shown to help reverse the problem, and may lower your reading by as much as nine points in eight weeks, says a new study. Together, two of olive leaf's active compounds - oleuropein and oleanic acid - have the power to relax slightly tight blood vessels, explains James F. Balch, M.D. You can also normalize your blood pressure with fiber. Simply eating a high-fiber diet can help up to three in four people get their blood pressure under control - often in as little as one month - by stopping blood sugar from soaring to harmful levels. The study-proven dose of fiber is 15 grams daily. Get it by eating two to three cups of fresh produce, plus a serving of beans or high fiber cereal. You can take a shortcut by taking two heaping tablespoons of a soluble fiber supplement or eat two apples daily. And of course don't forget one of the best things for pressure, a Chiropractic adjustment! There was a study done a few years ago where patient's were tested for high blood pressure then adjusted. Within a few minutes patients were retested. As a result, their blood pressure readings went down, an amazingly quick change. There were no side effects, the patient's felt better, and they were able to see the power of an adjustment. The flu is not a season, it's simply you body's inability to adapt and fight off a virus. With the cold weather, more and more people are talking about the flu and colds. So why does the flu always seem to make an appearance around this time every year? There are a couple of contributing factors worth mentioning. The cold weather tends to keep us indoors, causing a decrease in physical activity and decreasing our Vitamin D levels. Natural sun exposure is the best way to get healthy, immune boosting Vitamin D.
Less physical activity can cause us to become more stressed. In turn, we are more likely to reach for the sugar. Sugar causes the immune system to weaken, giving our bodies less of a chance to fight off the flu. The biggest way to avoid the flu this year is to keep your immune system thriving! Stay hydrated, get 7-8 hours of sleep per night, fuel your body with plenty of organic fruits and vegetables, strive for just 15 minutes of physical activity per day, and most importantly, stay well adjusted! Did you know that regular Chiropractic care boosts the immune system by 200%?! Is it bad if I move a certain way and I hear a crack or a pop? A very common questionI get. It's not necessarily a bad thing, nor a good thing. Synovial joints, little fluid-containing pockets where two bones meet, provide the necessary room for joints to move properly. Being that these joints are contained and constantly moving, nitrogen gas builds up in the joint space. When that space is opened up, whether it be because of a certain movement or an adjustment, the gas escapes causing the popping sound. But although you may never hear a pop, it doesn't necessarily mean that the bone is being adjusted back to its proper position, just as a bone CAN be adjusted back to its proper position without the pop if there's no built-up gas in the joint space at the moment of the adjustment. So again, not necessarily a bad thing as long as the movements are within your regular range of motion. However, once you start using your hands to twist your head/back/other body parts to an EXTREME to get a pop, this is when it becomes dangerous and may cause ligament stretching and damage. Chiropractors receive years of training to know the exact line-of-drive, and bone to adjust - don't try it at home. Some Facts for your Sweetheart this Valentine's Day * Every year around 1 billion Valentine cards are sent. After Christmas, it's the single largest seasonal card-sending occasion. * Teachers receive the most Valentine's Day cards, followed by children, mothers, wives, and then, sweethearts. Children between ages 6 to 10 exchange more than 650 million Valentine's cards with teachers, classmates, and family members. * Of people who buy Valentine's Day flowers 73% are men, while only 27% are women. * In the Middle Ages young men and women drew names from a bowl to see who be their Valentine. The best way to stay up-to-date with all the happenings at our office is to "LIKE" our Facebook Page by clicking HERE.